REVIEW: Tommaso Forcella Road Bike. Is It Really The Greatest? For people who are looking for a quality budget road bike, this Tommaso Forcella might be for you. Tommaso has designed a road bike for all of those who are looking to upgrade their standard road bike. 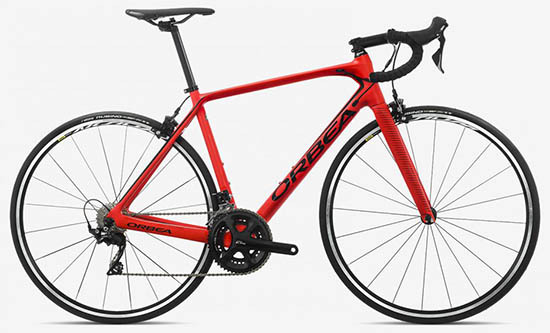 It is an entry-level road bike with several features that put it in the same range with some much more expensive bikes. Tommaso Forcella road bike will let you go the extra distance because of its light weight thanks to the aluminum frame and carbon fork. On top of that, it’s a good-looking bike as well. It features a modern design (like all Tommasos) with a black paint job which will make it look more high-end than it really is. The carbon fork on the Tommaso Forcella is something that cannot be seen on many entry-level road bikes so it is a huge plus. Another thing that goes in favor of Tommaso Forcella is that it is designed and produced in Italy. In the age of consumerism when most goods are produced abroad to cut costs, it is reassuring to know that you get the benefits of the original Italian design and quality. Being that this is an entry-level, the Forcella comes at an affordable price (of $750), but it gives you a lot in terms of components. This Tommaso Forcella road bike comes with a complete trustworthy Shimano Claris groupset including the shifters, brakes, and the drivetrain. In addition to that, it has some other positive features, but some slight downsides as well. Let’s cover all of them so that you have a complete image of the bike before you decide to click the “buy” button. 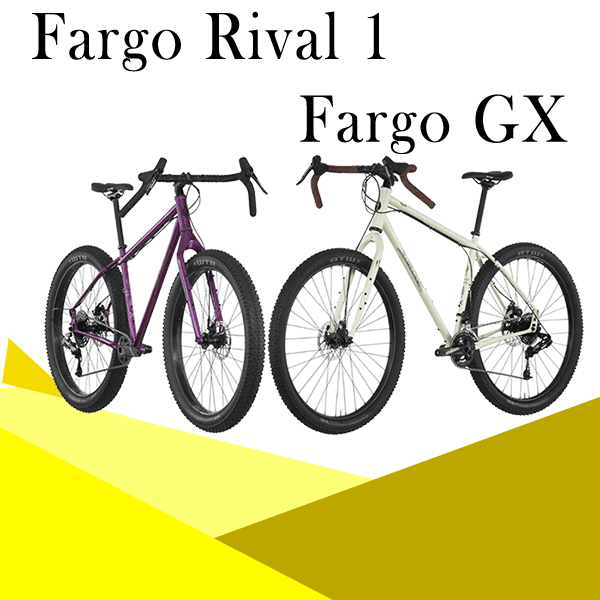 At first glance, the frame doesn’t look much different than other aluminum frames in this price range. It is a 6061 alloy composite frame that is pretty lightweight and reduces road vibrations well. However, one thing that is different about it is that it is produced by Tommaso, so it is made in Italy, rather than outsourced to another country. Apart from the quality, this can be seen in looks as well. It’s a very stylish and modern-looking frame with a paint job that we really like. Another thing that sets Tommaso Forcella apart from similar road bikes in its category is definitely the fork. 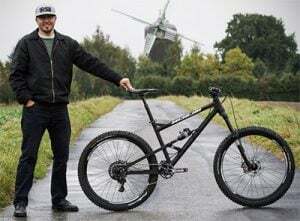 You cannot see a carbon fork on many road bikes that cost this much. Carbon is known as the most lightweight material out there. However, apart from that, it also soaks up the imperfections of the road the best and by that improve the ride as well. This fork makes Tommaso Forcella really stiff and stable and the transfer of power from the pedals to the wheels is noticeably improved. The drivetrain on this Tommaso Forcella road bike is a part of the Shimano Claris groupset. While this group of components is not regarded as high-end, they are still a part of reliable and durable Shimano equipment. The crankset has three cogs, while the cassette on the rear has 8. This is not a very common combination of gears on most road bikes, however, it’s not a bad choice. If you live in an especially hilly area, this will give you an extra number of gears that you can choose from. However, the bulky crankset does add some extra weight to the Tommaso Forcella, so if ever you wish to reduce the weight, you can upgrade your bike to a 2×10 drivetrain. 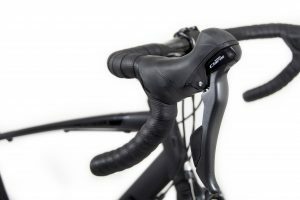 The derailleurs are also a part of the Shimano Claris group, alongside with the shifters which are integrated into the brake levers. 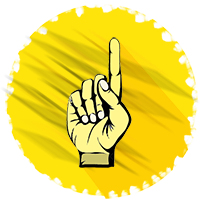 This means that you will not have to move your hand position when you need to shift gears, so you will increase your overall cycling performance of this Forcella. People generally have no complaints about the Claris groupset of this Tommaso Forcella. When it is adjusted properly and maintained in the right way, it will serve riders well for a long time. It adds some extra weight to the bike compared to some higher-end components, but for this price, the Claris is a great choice. The 700x25c Kenda tires on Tommaso Forcella road bike offer a great compromise between speed and comfort. 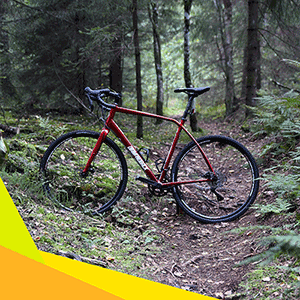 You will have a wide enough contact point with the road for a stable ride both on rough roads and in wet weather. 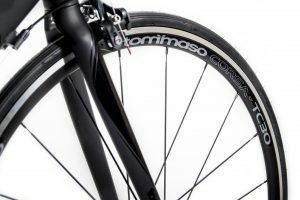 The wheelset is a Tommaso TC-30, which is lightweight and aerodynamic. 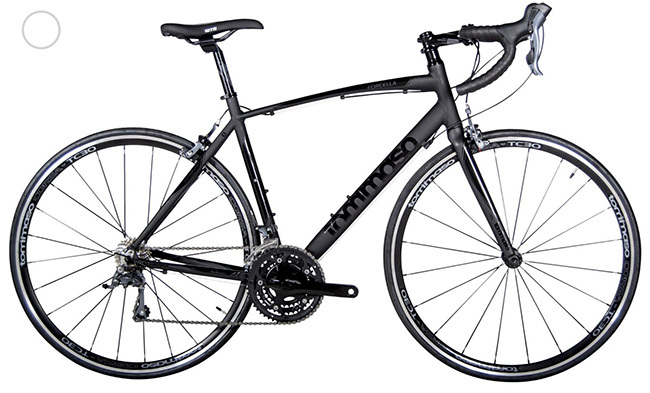 It’s one of the better choices for an entry-level road bike and it adds to its mean roadie look as well. 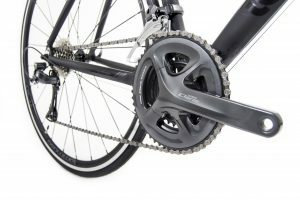 Brakes, like the drivetrain and derailleurs, are part of the Shimano Claris entry-level road bike groupset. The brakes are calipers and not disc brakes, which has both positives and downsides. You will get plenty of stopping power in the dry weather with this Tommaso Forcella both on the flat and when you are descending. On top of that, they are much lighter than disc brakes, so if you do not need discs it is better to reduce some weight of this Tommaso. On the other hand, if you live in the part of the world that has a lot of rainfall, these brakes will still perform well, but not at the same level as disc brakes would. For the saddle, Tommaso has partnered with a saddle manufacturer to produce the WTB Volt – Tommaso Forcella saddle. The saddle is comfortable and light and features a Tommaso logo, so it looks nice as well. In the beginning, it might be uncomfortable until you break it in, but that’s a standard with all road bike saddles. The fact that this Tommaso is delivered with pedals is a plus as well since many bike manufacturers do not include this. The default pedals are flat, so if you wish to upgrade and ride more serious mileage, you should invest in some clipless. Do we recommend Tommaso Forcella? As you can see, you really get a lot for your money with the Tommaso Forcella road bike. 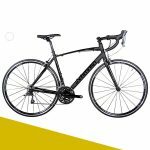 If you’re looking to upgrade from your previous bike to a road bike that will allow you to cover more distance with less effort, you should definitely give it a thought. The original Italian design and production process is a guarantee of quality and longevity. The Tommaso Forcella is maybe the most that you can ask from a beginner’s road bike model that is at the lower end of the price range. The most positive thing about it is its carbon fork that not only performs well, but it looks great as well. 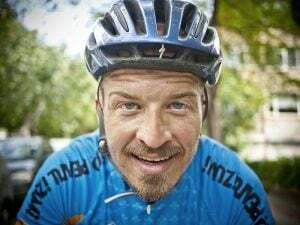 If you’re not yet sure if you are serious about road cycling and if your love towards cycling will last this is a good choice for you for one reason. The Tommaso frame produced in Italy will provide a good base for your future upgrades if you decide to have any and take your ride to the next level.